Lotteries have been around for a long time. Up until 2004, European countries all had their own lotteries. This is still the case, although something new has been added: a European lottery. Or actually, there is two of them. After EuroMillions took off, back in 2004, the time had come for the first drawing of the Eurojackpot on March 23, 2012. From the start, the gaming companies behind this lottery already had the intention to become at least as big as EuroMillions. And surprisingly enough, they actually seem to have achieved this. Eurojackpot has not become a bland copy of EuroMillions. Quite the contrary, in fact. It is an extremely popular lottery that millions of people take part in each week. Who knows, you might just be one of them. Eurojackpot is the result of a collaboration between various national lotteries. Six countries took part in the first drawing in 2012. The countries that initially took part in the EuroJackpot were Germany, The Netherlands, Finland, Denmark, Estonia and Slovenia. The idea for a new European lottery seemed to catch on quickly, and by now, the number of participating countries has grown to eighteen. Amongst others Italy, Iceland, Norway, Croatia and Hungary are taking part as well. Of all these countries, only Spain is taking part in both the Eurojackpot as well as the Euromillions lottery. The past years have shown that European lotteries are a great success. For many people, the sizeable jackpot is the main reason to take part. The idea for such a big lottery with an extra high jackpot comes (perhaps not surprising) from the United States. Here, lotteries like Mega Millions and Powerball have been luring in huge numbers of players for years. That Europeans also enjoy placing a wager, is very obvious. Ever since its early days in 2012, Eurojackpot has only continued to grow. Taking part in Eurojackpot is very simple. You purchase a lottery ticket with a grid of fifty numbers and ten bonus numbers. You have to select five of the regular numbers. After that, you select two of the bonus numbers. This is all that you have to predict. Did you fill out your numbers? Now there’s nothing left to do but wait until the drawing starts. The Eurojackpot draw is every Friday night at 9 pm CET. Each week, you will have a shot at winning astronomical cash prizes in Eurojackpot. Have you correctly predicted all numbers? Then the Eurojackpot is yours. With Eurojackpot, you can already win big amounts with a relatively small bet. This is what makes EuroJackpot so incredibly popular amongst participants. Lottery tickets can be bought for as little as 2 euros, and this loose change will give you a shot at winning the full jackpot. The jackpot adds up to at least 10 million euros. For every week that goes by without a winner, the amount will increase steadily. Eventually the jackpot can end up at a maximum amount of 90 million euros. And this prize has already been paid out several times over the past years. Once the maximum jackpot amount has been reached and no winner has been identified, each player will benefit from the Eurojackpot. The money that would normally go to the jackpot, will now be divided amongst the other cash prizes won. This way, chances only pretty good that a significant cash amount will be credited to your bank account. Of course you are already dreaming about those millions and millions of euros that can be won in the Eurojackpot. Although just as for any other lottery, your odds of winning are not that great. Thankfully there are still some other cash prizes that are definitely worth the effort. At Eurojackpot, you already win something if you get 3 out of 12 numbers right. The exact amount of prize money is not known in advance. This is because of the somewhat complicated mathematics that Eurojackpot uses. For this lottery, the winners are divided in twelve categories (or rankings). As such, there is a category for players who correctly guessed four regular numbers and one bonus number. With three regular numbers and two correctly predicted bonus numbers, you will already end up in another category. Each category will be allocated a certain percentage of the revenue. In total, about one euro of each lottery ticket sold is dedicated as prize money. The more lottery tickets are sold in a week, the higher the eventual winnings for each category will be. Do you happen to fall in a category for which there are a lot of winners? Then you are out of luck. After all, the total profit per category will be divided amongst all the winners. This even applies to the jackpot. If you happen to get all the numbers right, you therefore better hope that you are the only one to have done so. What is the difference with that other big European lottery? While discussing Eurojackpot, we cannot avoid mentioning that other big European lottery: EuroMillions. 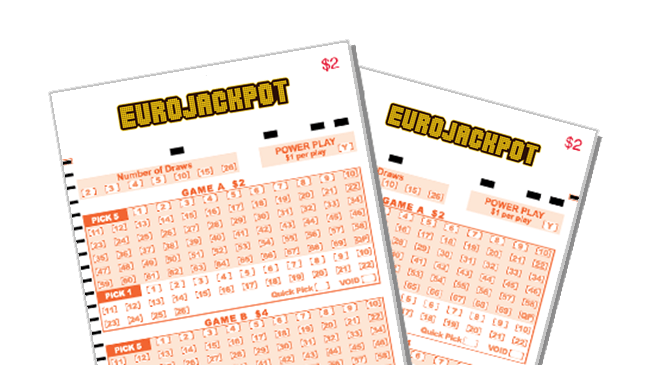 Initially, Eurojackpot was seen as the smaller brother of EuroMillions. Yet this has changed in recent years. While EuroMillions has nine participating countries, Eurojackpot already has eighteen. However, the jackpot of Eurojackpot is slightly lower. The jackpot amount, ranging between 10 and 90 million euros, is trumped by EuroMillions with amounts ranging between 17 and 190 million euros. Yet statistically speaking, your odds of winning the jackpot are better when taking part in Eurojackpot. As such, both lotteries have their own unique advantages. Fact is that Eurojackpot has stepped out of the shadows of that other big European lottery a long time ago. The drawing of Eurojackpot takes place every Friday night. In order to take part, you have to be in possession of a lottery ticket on Fridays before 6:55 pm CET. Of course you might have been too busy to go to the shop. Your country may not be participating in Eurojackpot. Or perhaps you simply forgot and only realise late Friday afternoon that you actually wanted to take part. TheLotter.com will then be your answer. Here, you can purchase lottery tickets online for all the great lotteries that are played around the world. Eurojackpot is certainly one of those. The official lottery tickets that you purchase through TheLotter will instantly be mailed to your email address. Even if you only decide to take part at the very last minute, you will have the lottery ticket in your hands in time for the draw, starting at 7 pm CET. Ready to win the EuroJackpot? The EuroJackpot is a European lottery that is organised by the 16 participating European countries. Because of this, the EuroJackpot can be considered one of the biggest lotteries of Europe. The EuroJackpot kicks off with a jackpot amount of € 10 million and can add up to the amazing amount of € 90 million. Want to have a shot at such an amazing cash prize and try your luck in the EuroJackpot? You can now receive a 15% discount via Loten.com if you take part in 5 draws of the EuroJackpot! Get your EuroJackpot tickets here!